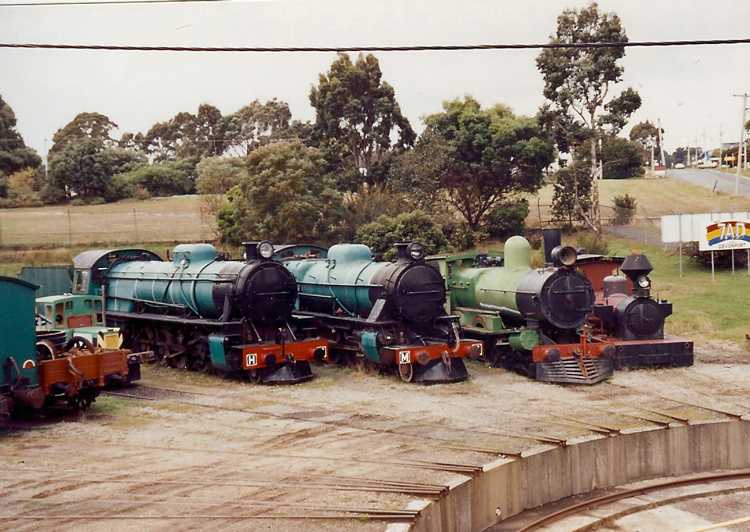 This scanned photo shows A4 (in apple green livery; second from the right) displayed on a turntable road at Don in May 1993. It is in company with H7, M3 and Hudswell Clarke B/N 1548. 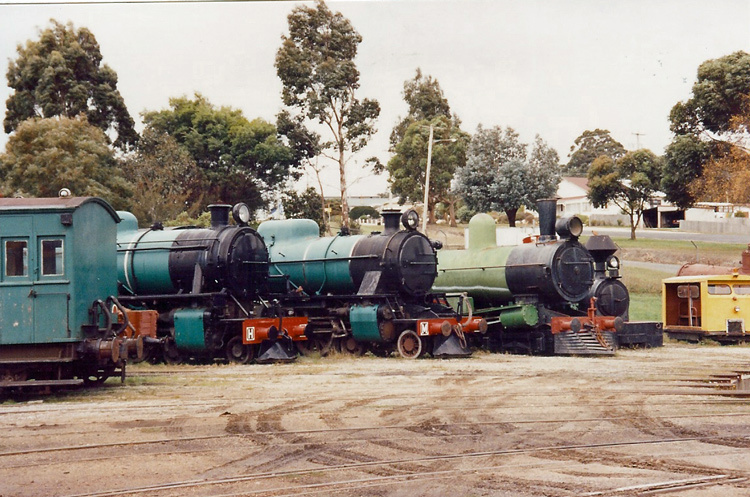 A4 is the only survivor of eight A-class 4-4-0 locomotives which were built by the famous Manchester locomotive builders Beyer Peacock & Co. for the Tasmanian Government Railways. Preserved locomotive A4 carries the Beyer Peacock & Co. builder's number 3392 of 1892. The A-class were built to a classic Beyer Peacock 4-4-0 configuration for express passenger duties of the period. The A-class locomotives were delivered with low-pitch round-top boilers and a sloping smokebox (similar to that seen on C22). The appearance of these locomotives was significantly altered when later rebuilt by the Tasmanian Government Railways in their Launceston Workshops with high-pitch Belpaire boiler and the characteristic TGR front-end comprising an extended / self-cleaning smokebox and stovepipe chimney. All A-class engines were withdrawn in the very early 1950's following the arrival of the X-class diesel-electric locomotives. They were stored derelict at Turners Marsh until seven were scrapped in 1956. Royal train engine A4 was spared but it was not until a few years later that it left storage for restoration. In 1960 it was plinthed in Launceston City Park, where photos show it wore an attractive apple green livery. A second scanned photo view of H7, M3, A4 (in apple green livery) and Hudswell Clarke B/N 1548 at Don in May 1993. The TGR front-end of extended smokebox and stovepipe chimney is prominent. My visit to the Don River Railway of May 2003 found the chassis of A4 under overhaul in the workshops. The crest resting under the smokebox saddle is a reminder of this locomotive's use as a Royal Train engine.